Willi: Thank you to my fellow mythologist Arthur George for this interview, author of the excellent The Mythology of Eden. 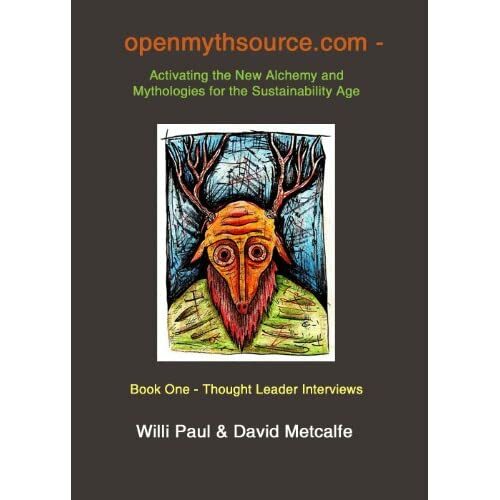 Arthur: In July and again in September, I posted here 2 conversations I had with my friend and fellow mythologist Willi Paul about the “new myths” and creative mythology. 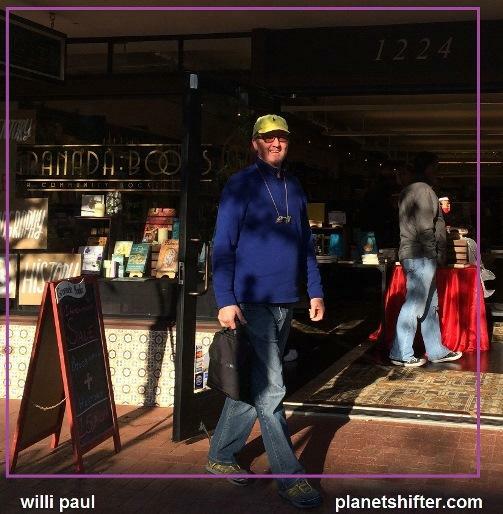 Willi will be leading a roundtable on creating new myths at the Granada Book Store in Santa Barbara, California, on January 22, so we thought it would be timely to discuss here on my blog – Mythology Matters – the ideas he will be presenting there. Our conversation is below. 1. How do the “new myths” differ (if at all) in content and/or purpose compared with traditional myths? Lately I am seeing this “old vs. new” myth debate forming a hybrid set in that many plots and heroes from classic mythology can support the messages in the new myths of the Climate Change Age. We see that new myths reflect the universal issues of 2015: species extinction, terrorism, GMO and drought to name a few. Let’s take the journey, initiation and hero triad from Joseph Campbell’s work and support new community survival songs, poems and tales. While technology enables both new and old mythologies to be experienced on a tablet or a home browser, new myths require a new vision and design – and intervention. See Myth Lab. Also, there are many types of mythologies to drive a new planet consciousness including creative, creation, classic, apocalyptic, sound, and mythopoeic. I am working on a Unified Model of Mythology to better understand this synergy moving forward. 2. What is the creative source for the new myths? How is human psychology involved? Sources include boredom with the classic myths and our destruction of Nature and each other. I believe that we all artists with the capacity to reach inwards and outwards to experience bliss. Meditation is a key source for the creative. + Permaculture & Nature Archetype: A deep love for freedom to own fire arms; fear of guns and killing. Archetypes can be seen as conscious and unconscious “code” to build and advance human evolution. The Internet is our primary broadcaster for new archetypes, symbols and new myths. Like software code – it is complied, tested and re-written over and over throughout history. Heroes update the data and write the new code. 3. Can you summarize the process for constructing a “new myth” for the present age? How does this differ from how the traditional myths were composed (to the extent we understand this)? New Myth makers need initiation and tools to guide them. Reading Campbell and other leading authors, including Mircea Eliade and JRR Tolkien. Many see a new mythology channels in Star Wars. Ultimately new myths will rise from our personal interaction with community, Nature and Sci-fi and less from formal western religions. The Artifact is a Nature-Human combination. Some examples include graffiti, a bill board message, an historic sculpture, and a permaculture garden, all with hidden special powers and messages to the neighborhood. The Artifact can evoke a magical journey or a mythic struggle and is the foundation focus or primer for new symbols and the imprinting and creation that follows. Imprinting is defined as a two-way interaction with a selected Artifact that generates synergistic meaning for both participants and the Artifact. 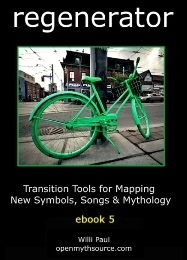 Called “mythic imprinting” in the Myth Lab, this iterative and transmutative stage is grounded in the initiation, journey and hero work from Joseph Campbell and is one way that neighborhood artifacts can help neighbors generate new songs, poems and myths. 1. What did you like about the Artifact? Describe the visual and sonic messages in the forest journey. 2. Did the Artifact remind you of any story or song from your childhood? How? 3. Did the piece heighten your senses or support a new vision for you? Please describe. This is the Hero’s duty. 4. What, if any, role does one’s community play in developing new myths, or as serving as content in these myths? How large or small in scope is the community? The community is our extended family. Through localization, our neighbors can become our news sharers, vegetable farmers and spirit guides. Here is a wise and caring future template for new myths. Now Mount Olympus becomes East Oakland and a Myers lemon tree is a powerful symbol of community zest and sustainability. 5. In light of the role of ritual in many traditional myths, what kinds of rituals do you envisage as taking place in connection with new myths? Perhaps you have some examples? I am generating mostly new community sharing rituals that by-pass the “Wal-Mart price point,” throw-away scene that drains our spirits. 6. How can music (or other sounds) constitute a myth in whole or in part (supporting it)? While I understand that few are trained to hear sounds as symbols (or myths), this is where I started my work in sonic mythology. If you create a lattice of interacting elements that includes words, graphic symbols, soundbytes and a unifying score, the artifact(s) can emerge and a story can unfold. I do envision a day in the near future where humans will close their eyes and experience new myths and rituals. This entry was posted in Alchemy, animation, Campbell, localization, Myth Lab, Myths, permaculture and tagged 1/22/15, Arthur George, bill board message, Climate Change Age, Exercising the Artifacts, Graffiti, Granada Books, hero, historic sculpture, Interview, Myth Lab, myth sounds, Mythic Imprintation, Mythic Roundtable, Mythologist, myths, new community survival songs, New Myths, new rituals, permaculture garden, Permaculture Nature Archetypes, poems and tales, Psychology, Rituals, Santa Barbara, sounds, Symbols, Unified Model of Mythology, Willi Paul, [ open myth source ]. Bookmark the permalink.